A new Gmail add-on is the first product from a partnership between Dropbox and Google. A few years ago, Dropbox partnered with Microsoft, and the official line about the partnership was that the cloud-storage company wanted to help its users work better and easier in the tools they're already used to. For untold millions, Microsoft Office is a big part of that workflow, so tying Dropbox tightly into Office made both services work better. Today, Dropbox is doing the same thing with Google. A partnership between the two companies was announced earlier this year, and today we're seeing the first product: a Dropbox add-on for Gmail. As you might expect, this new add-on makes it a lot easier to bring your Dropbox content into Gmail, but that's not all it does. Once the new plugin has been installed, it shows up on the right-side rail of Gmail; in the new redesign, it's in the same spot as the links that open Calendar, Tasks or Keep in the same window as Gmail. Clicking that Dropbox icon prompts the app to scan whatever email thread you have open for attachments, whether they're links to Dropbox or more traditional file attachments. Rather than just a list of files, the Dropbox add-on includes handy contextual info -- who sent the file, when it was shared, the file names and where it can be found (Dropbox or email). It's a pretty simple solution, but if you've ever dug through dozens of messages in an email thread to find that one the file you need, you'll appreciate this new tool. The sidebar add-on also gives you a full view of your Dropbox file structure, which comes in handy for adding files to the folder you want rather than a "downloads" dumping ground. It also means you'll eventually be able to attach files from Dropbox into your email without having to search through what's synced to your computer's local storage. At a time when users keep less on their local drives and more in the cloud, it's a nice touch. Unfortunately, that's not ready as of launch today; we just know it'll be be available later this year. Naturally, there's a mobile component to this, as well. Once you get your Dropbox set up in Gmail on the web, it'll also show up in the official Gmail apps for Android and iOS. As with other add-ons, it'll also work across browsers and platforms, so anywhere you login to your Gmail will also be linked to your Dropbox. The integration will be available on Android as of today, and it's "coming soon" for iOS. 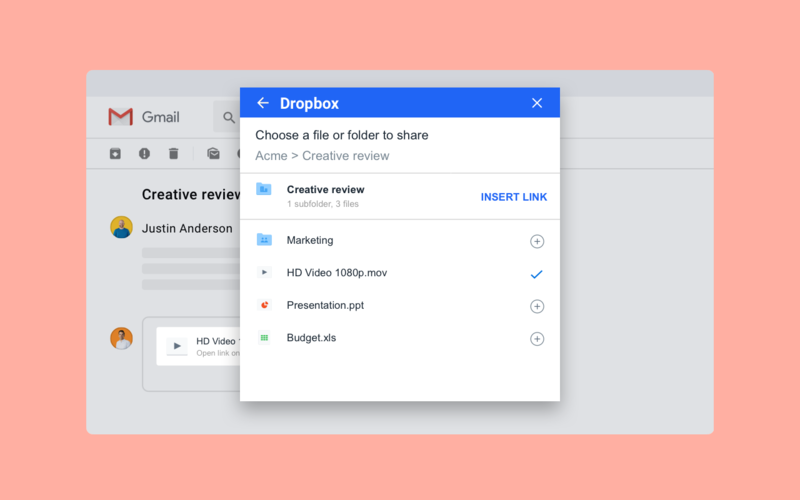 It's a somewhat surprising partnership, as Google and Dropbox compete on a few fronts: Google Drive storage has many of the same features as Dropbox, and Dropbox's Paper bears plenty of similarities to Google Docs. That said, Dropbox product manager Ketan Nayak noted that the crossover between Google and Dropbox users was a lot more important than the competition. For example, he said that "hundreds of millions" of Dropbox users have made a Gmail account, while 50 percent of Dropbox users also use Gmail. "It's all about user choice, our customers want to use the tools they love and they want that choice," Nayak said. "This is the common vision of platform openness that Dropbox and Google share, and that's what brought us together." That's some business-speak -- but it's also true. Gmail is clearly the dominant player in consumer email, and it's also becoming increasingly popular in business. And for the most part, Dropbox isn't recreating features and services that so many people are already using from Google and Microsoft. Making Dropbox work with as many other popular services as possible should go a long way towards keeping people and companies using it.